Erika Wentz, Wisconsin District Tennis Service Representative was awarded the prestigious 2008 Nancy Mickler Memorial Award at the USPTA Midwest Division Annual Meeting. This award is presented to the Midwest woman member who has done the most to promote tennis within the USTA Midwest Section. In addition, Erika has been acknowledged by the Midwest Section for the success of a partnership she has created with the Milwaukee Public School District (MPS). She has worked with MPS, the largest school district in the state of Wisconsin with over 284 schools. As a result, 25 instructors have been trained to offer after school programs using the QuickStart format in 20 Community Learning Centers in Milwaukee. This partnership will service over 1100 students! The mission of the Tennis Service Representative is to increase participation in tennis by promoting, developing and servicing tennis programs in the Wisconsin District. Erika has traveled the entire state and has established relationships with tennis and non-tennis facilities, organizations and volunteers, delivering tennis and creating tennis programming. As a result of Erika’s travels and contacts, the 2009 tennis season in the Wisconsin District is off to a great start. There are 5 new markets that will institute the 10 and under QuickStart Tennis Program, in addition to the 5 pilot markets introduced last year. There are 5 new Community Tennis Associations that have been incorporated to deliver tennis programs to their communities. In addition to MPS, 4 new school districts will be implementing tennis in their curriculum. 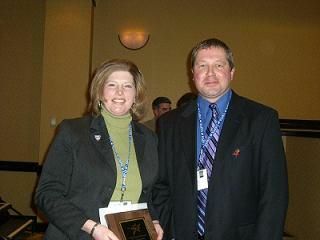 The Wisconsin Tennis Association congratulates Erika on her award and service to the Wisconsin District.